Stigmata is a supernatural horror film directed by Rupert Wainwright and starring Patricia Arquette that was released in 1999. It tells the story of a young American atheist, who, by way of an unfortunate gift, starts to suffer the phenomenon of Stigmata. In some ways it is a movie about possession but is more about the message being delivered. I expected to hate this film as presumed it would be an advertisement for organised religion but I was completely wrong. It is quite the opposite. The film centres on Frankie Paige (Patricia) who plays an atheist hairdresser from Pennsylvania, who starts to suffer from the stigmata after acquiring a rosary formerly owned by a now deceased priest who had also suffered from the phenomenon. Gabriel Byrne co-stars as a Vatican official called Father Kiernan who investigates cases such as these from a scientific point of view. He unhappily describes his own job as “someone who disproves miracles” and is often described by his colleagues as “not knowing if he is a scientist or a priest”. 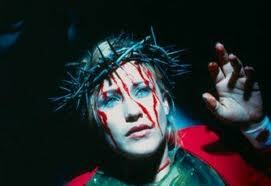 Despite the obvious religious theme of the stigmata, the film sways heavily towards showing the corrupt side of organised religion rather than being an advertising board for the Catholic, or any other, Church. The film starts with Father Kiernan investigating one such miracle in the form of a statue crying tears of blood over the death of a well-loved local priest. It is the rosary of this priest that eventually is stolen by a child, sold at a market and ends up in Frankie’s hands as a gift from her mother. Frankie is introduced as the perfect stereotype. Out drinking, getting laid, wakes up late for work where she is a hairdresser, stops at Starbucks for a coffee on the way etc……. Not long after receiving the gift from her mother, she is having a bath when an unseen force attacks her. As the blood fills the bath tub you see that she has two large puncture wounds through her wrists which signal the start of the affliction for her. No cause can be found for her wounds at the hospital so it is mentioned that maybe she did it to herself although everyone seems genuinely shocked at the suggested self-harming as she “loves her life”. A further incident on a train sees her held up by invisible arms and lashed in full view of other passengers. This incident is witnessed by a priest who sends footage to The Vatican who in turn sends Father Kiernan to investigate and discredit the apparent miracle. After Father Kiernan and Frankie meet, she informs him of her atheist beliefs to which the church instantly believes her condition to be a hoax as they see The Stigmata as a blessing that would only ever happen to the most dedicated and honourable of priests. As Frankie suffers from further wounds, in view of Father Kiernan, such as head wounds from a crown of thorns, he starts to believe although his findings seen back at the Vatican are laughed off as nonsense. There are some episodes of what appear to be possession with Frankie screaming in what turns out to be ancient Aramaic as well as the carving of ancient symbols onto walls and cars. Frankie continues to suffer from the stigmata by having puncture wounds rip through her feet all while Father Kiernan tries to convince the church it is real. Secretly we see that the church is well aware it is real and trying hard to cover it up, eventually trying to destroy Frankie as it turns out the words she is writing and saying in ancient languages are a great risk to the entity of organised religion. The film ends with a race between Father Kiernan trying his utmost to help Frankie who is rapidly approaching the final Stigmata which would end her life all while being discredited and eventually attacked by The Vatican, led by Cardinal Houseman (Jonathon Pryce) who, in order to keep their churches and treasures and flocks, need her message to not be heard. I personally found the story of Stigmata very interesting although it is very much going to offend believers in the Catholic Church or organised religion. It is not a dig at believers in God, just the system of church. The film has a gloomy and sombre tone to it and the camerawork and editing are hyper-charged which looks nice. There are little slow motion moments of doves flying and water drops that all add to a nice, pleasureable viewing. The soundtrack is understandably a mixture of rock and roll club scenes to show atheism I guess mixed with choir and gospel singing to represent religion and they are pushed together showing stark contrast. There are plenty of plot holes such as how simple it was for a child to steal the initial rosary. In a church with thousands of people surrounding it, and worshipping the fallen priest, a child just walks up and takes it out of the coffin and noone seems to see or mind. Another is how unbelievably stupid Frankie’s friends are. Especially her best friend Donna, played by Nia Long, who sees her friend get whipped by invisible beings and still asks her if she is self harming! That aside, the film throws out some shocking scenes with plenty of blood and gore and Patricia Arquette does a good job of gaining viewer sympathy which overall makes an okay film out of a very interesting subject. I quite enjoyed this film but that may be more because I like the subject matter and thought the film makers portrayed that matter interestingly. It looks and sounds good as well and carries a nice sombre undertone throughout. It doesn’t score any higher for me simply because there is not enough “horror” and so rather then being scary, you sometimes feel slightly uncomfortable instead. Good job with the wounds though, they do look great. Nice review, I recently watched this again and enjoyed the story more.